I make a habit of regularly talking to other technical traders like me, and recently I had the chance to catch up with my friend and fellow CMT Kim Sokoloff. I’ve known Kim for years. She’s been in the trading game since the late 1990s and is still at it, working out of her apartment in New York City. She’s up at 7 a.m. every trading day, looking at charts and prices to see what opportunities are there for the taking, if a particular stock is within her risk tolerance, or looks good based on the technical metrics. While I rip through 5,000 charts a week, Kim tends to focus on a smaller universe of stocks and it works just fine for her. One of her favorites to trade is in the oil industry, Hess Corp. (NYSE: HES), which she’s tracked for so long she considers the stock a friend. That’s the thing about technical trading. Your scope can come in any size, but the fundamentals are the same. We’re all focused on price behavior. You can listen to my entire chat with Kim here, including why she thinks there’s so few female technical traders, but I wanted to share the big important point here: Why technical trading, what we do, matters. I’m strictly technical. I’m not fundamental at all. I pay attention to economic data, but not fundamental data. I just look at the charts. From talking to people I know in the industry, the market – since we had the complete financial disaster – from 2009 on, with quantitative easing one, two and three, I feel like the market has always had a helping hand from the Fed. Even still to this day, everything holds on what the Fed says, or the president, or this person. I feel like it’s a lot more manipulated by outsiders. To me, it doesn’t feel like it does its own thing. Sometimes stocks don’t act the way they used to act. [Two weeks ago] Oracle’s earnings were bad, they told me they were bad, and the stock goes down and back up to close the gap. I think it’s the algorithms. [A stock] dips and they see it and they come in and buy it. If you’re not using technical analysis these days, do you think you’re at a huge disadvantage? I think so. A lot of portfolio managers over the years have become more technical than what they were. I think they either study or hire a technician. At the very least we’re seeing them admit it more. In the past, I feel like they would look at charts but wouldn’t tell anyone they were doing it. I feel like these days, it’s chilled out a little bit. I’m seeing more commentary about it from portfolio managers and traders. They’re not hiding it. But you’re saying not only are they not hiding it, these days it’s absolutely essential? I think it is. I think it helps as a fundamental portfolio manager to help them manage their risk. If they’re looking at certain moving averages. What’s the level that we break, where we’re in trouble? Or rise above and it’s great? There’s no wrong way to make money, but at the end of the day, all we’re focused on is price. I don’t know who these Powell and Kavanaugh people are, but I do see stock indexes making all-time monthly closing highs and that’s historically a characteristic of an uptrend. Price is the only thing that matters. 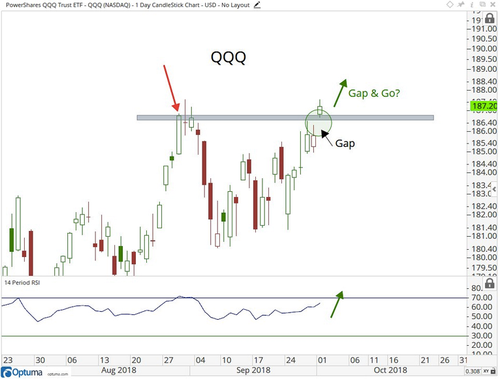 Speaking of, I’ll be watching the Nasdaq 100 ETF (Nasdaq: QQQ) closely. For the below trend to be a “gap and go,” I think prices have to be above $186.75, which is QQQ’s late August high. A failure would likely lead to volatility, but that’s less likely to me. If QQQ is above $186.75, it’s very hard to be bearish. Now, not every gap is filled. By definition, breakaway gaps, like this potentially could be, don’t get filled. The strongest breakouts don’t get filled by a re-test. Lastly, my friend Ben Carlson shared the below chart as part of his piece, “What If Stocks Don’t Crash?” to end this cycle. 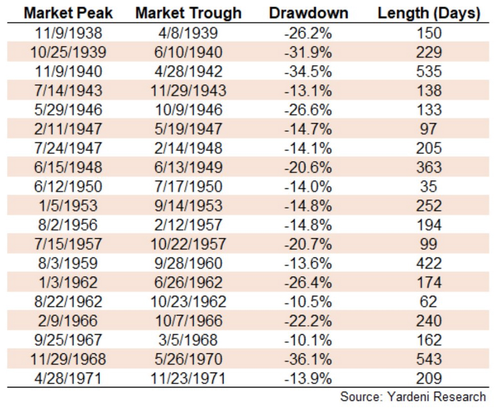 As Josh pointed out, between 1938 and 1972 there wasn’t a single stock market crash. That’s 35 years, an entire accumulation period for a working adult. It’s not impossible.